➤Only can be used while sitting, making it easy to get a convenient and versatile workout. And you can plug in the power to use & Use it directly without power. ➤Exercise on ANCHEER elliptical helps you burn calories, tone lower-body muscle and improve your cardiovascular health, all in a joint-friendly manner. ➤ LCD display: Scientifically design your foot movements, you can easily see the movement time, distance, steps and calories burned! Great workout! ➤Powerful pedal: The pedal area is 34*13cm. In addition to the large enough area, we use advanced design to let you enjoy foot massage while exercising. ➤Whether you're watching television, reading a book, or working out at the office, this compact strider can go wherever you go. ➤Flexible pulleys: Sturdy and flexible magnetic pulleys, combined with a powerful base, give you an unprecedented workout experience! ➤Portable design: The handle part is perfectly reserved for enough places, so you can transfer the sports place at any time, very powerful! 【2 in 1 & Compact】This leading compact ergonomic elliptical can plug in the power to assisted workout or use it directly without power. It also be used by either feet or hands and will strengthen and tone your legs and arms. It gives your full workout while you sit at home and office. 【Multiple Movement Options】Depending on your needs and abilities, there are Auto (P1-P3) & Manual (5-levels speed) for your choice. Pedals can forward or backward to target different muscles. Note: only use it while sitting. 【Built-in Display Monitor & Whisper Quiet & Portable】Start planning and recording your fitness statistics by using the advanced LED Built-in Display Monitor which keeps track time, distance, scan, speed, calories burned. Designed specifically to be whisper quiet, You can enjoy the convenience of working out without disturbing those around you. It's portable and easy to move. No assembly required. 【Excellent Exercise Equipment & Ideal Rehabilitation】Excellent exercises to improve body flexibility and muscle strength, as well as helps to promote cardiovascular functions and improve coordination of arms and legs, great low impact exercise for beginners and perfect for rehabilitation following a surgery or injury. 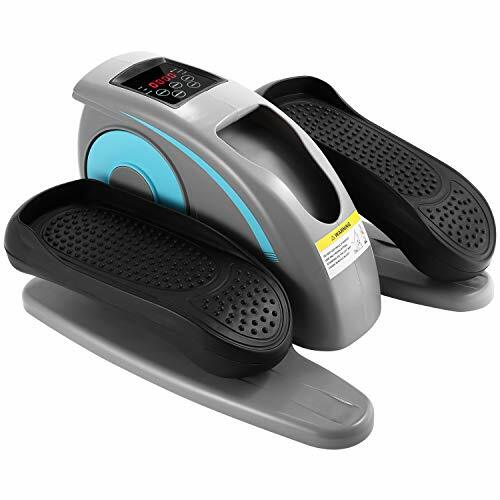 【Large Anti-slip Pedals & 1 year Warranty】Get an effective workout with large textured anti-slip foot pedals and low-attention exercise promotes leg movement and improved circulation in a non-distracting way.This elliptical has 1 year guarantee on material.